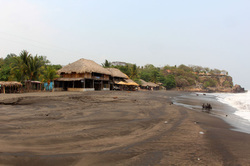 Hostal Arenas and Tiola Restaurant. Backpacker accommodation hostal for young travelers or rustic lovers, right on the sand, this hostal offer rooms at three house with sharde bathrooms and also concrete rooms with private bathroom, all of them infront of the ocean at Palmarcito beach. rooms with a double bed. Contact hostal for more information.